Computer Media is dedicated to providing complete computer services to residential and commercial customers in Broward and Palm Beach counties. We excel at personalized service, technological expertise, and custom design and consulting. 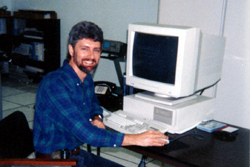 Carey working with computers in the 1980s. Throughout its existence, Computer Media has been owned and operated by one man, Carey Mason. In the past, he has worked for technology companies such as Harris Computer Services, Gould Electronics, Encore Computer Corporation, and Sun Microsystems. He has extensive software and hardware experience, and brings a host of technical expertise to his company. He has worked on computer systems and trained engineers around the world, working with clients such as the British Navy, the Jet Propulsion Laboratories in California, the Pacific Missile Range in Hawaii, and the Royal Canadian Air Force. He has also worked with all branches of the U.S. military, and on the computer systems for the space shuttle and the F117 stealth fighter. His company, Computer Media, currently works with individuals with simple or complex computer needs, as well as schools, small businesses, and other commercial clients. Carey jamming on a Danelectro guitar. Carey is a long-time Florida resident and active community member. 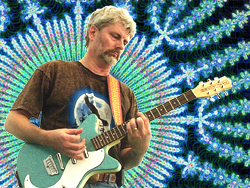 He leads a music ministry at St. Vincent Ferrer Catholic Church in Delray Beach, and plays guitar in a local band. For 20 years, he served as Scoutmaster of Boy Scout Troop 304 in the Gulf Stream Council. His three sons are all eagle scouts and live and work in Florida, where they helped him build the geodesic dome in which Carey and his wife currently live.